Hiring? Toptal handpicks top Java engineers to suit your needs. Automated software tests are critically important to the long-term quality, maintainability, and extensibility of software projects, and for Java, JUnit is the path to automation. While most of this article will focus on writing robust unit tests and utilizing stubbing, mocking, and dependency injection, we will also discuss JUnit and integration tests. The JUnit test framework is a common, free, and open source tool for testing Java-based projects. As of this writing, JUnit 4 is the current major release, having been released more than 10 years ago, with the last update having been more than two years ago. JUnit 5 (with the Jupiter programming and extension models) is in active development. It better supports language features introduced in Java 8 and includes other new, interesting features. 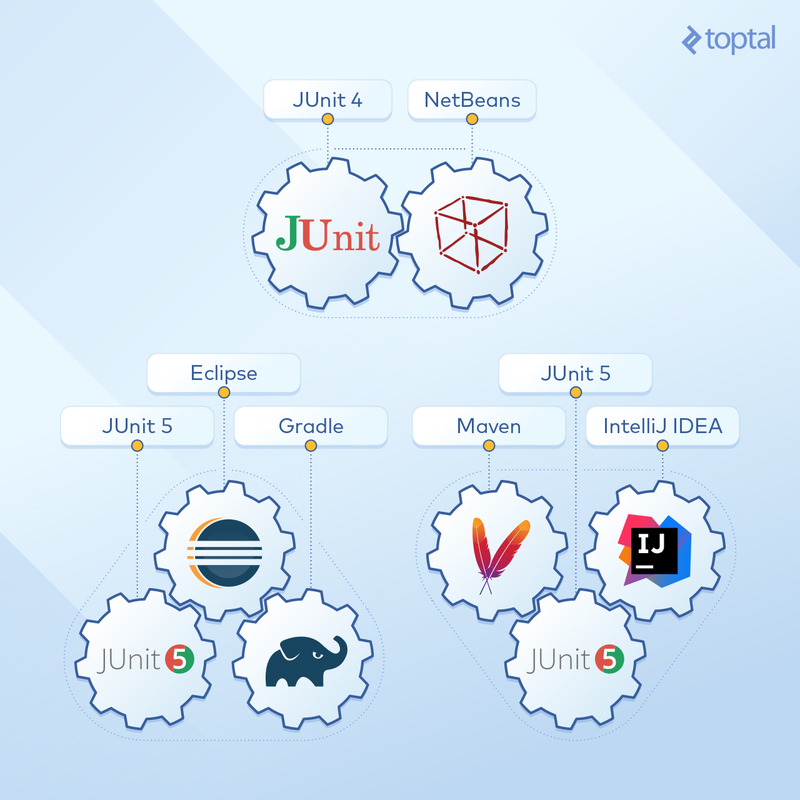 Some teams may find JUnit 5 ready for use, while others may continue using JUnit 4 until 5 is officially released. We will look at examples from both. JUnit tests can be run directly in IntelliJ, but they can also be run in other IDEs like Eclipse, NetBeans, or even the command line. Tests should always run at build time, especially unit tests. A build with any failing tests should be considered failed, regardless of whether the problem is in the production or the test code– this requires discipline from the team and a willingness to give highest priority to resolving failing tests, but it’s necessary to adhere to the spirit of automation. JUnit tests can also be run and reported on by continuous integration systems like Jenkins. Projects that use tools like Gradle, Maven, or Ant have the added advantage of being able to run tests as part of the build process. As a sample Gradle project for JUnit 5, see the Gradle section of the JUnit user guide and the junit5-samples.git repository. Note that it can also run tests that use the JUnit 4 API (referred to as “vintage”). The project can be created in IntelliJ via the menu option File > Open… > navigate to the junit-gradle-consumer sub-directory > OK > Open as Project > OK to import the project from Gradle. For Eclipse, the Buildship Gradle plugin can be installed from Help > Eclipse Marketplace… The project can then be imported with File > Import… > Gradle > Gradle Project > Next > Next > Browse to the junit-gradle-consumer sub-directory > Next > Next > Finish. After setting up the Gradle project in IntelliJ or Eclipse, running the Gradle build task will include running all of the JUnit tests with the test task. Note that the tests might be skipped on subsequent executions of build if no changes were made to the code. For JUnit 4, see JUnit’s use with Gradle wiki. For JUnit 5, refer to the Maven section of the user guide and the junit5-samples.git repository for an example of a Maven project. This can also run vintage tests (ones that use the JUnit 4 API). In IntelliJ, use File > Open… > navigate to junit-maven-consumer/pom.xml > OK > Open as Project. The tests can then be run from Maven Projects > junit5-maven-consumer > Lifecycle > Test. In Eclipse, use File > Import… > Maven > Existing Maven Projects > Next > Browse to the junit-maven-consumer directory > With the pom.xml selected > Finish. The tests can be executed by running the project as Maven build… > specify goal of test > Run. For JUnit 4, see JUnit in the Maven repository. In addition to running tests through build tools like Gradle or Maven, many IDEs can directly run JUnit tests. IntelliJ IDEA 2016.2 or later is required for JUnit 5 tests, while JUnit 4 tests should work in older IntelliJ versions. For the purposes of this article, you may want to create a new project in IntelliJ from one of my GitHub repositories ( JUnit5IntelliJ.git or JUnit4IntelliJ.git), which include all the files in the simple Person class example and use the built-in JUnit libraries. The test can be run with Run > Run ‘All Tests’. The test can also be run in IntelliJ from the PersonTest class. These repositories were created with new IntelliJ Java projects and build out the directory structures src/main/java/com/example and src/test/java/com/example. The src/main/java directory was specified as a source folder while src/test/java was specified as a test source folder. After creating the PersonTest class with a test method annotated with @Test, it may fail to compile, in which case IntelliJ offers the suggestion to add JUnit 4 or JUnit 5 to the class path which can be loaded from the IntelliJ IDEA distribution (see these answers on Stack Overflow for more details). Finally, a JUnit run configuration was added for All Tests. See also the IntelliJ Testing How-to Guidelines. An empty Java project in Eclipse will not have a test root directory. This has be added from project Properties > Java Build Path > Add Folder… > Create New Folder… > specify the Folder name > Finish. The new directory will be selected as a source folder. Click OK in both remaining dialogs. JUnit 4 tests can be created with File > New > JUnit Test Case. Select “New JUnit 4 test” and the newly created source folder for tests. Specify a “class under test” and a “package,” making sure the package matches the class under test. Then, specify a name for the test class. After finishing the wizard, if prompted, choose to “Add JUnit 4 library” to the build path. The project or individual test class can then be run as a JUnit Test. See also Eclipse Writing and Running JUnit tests. NetBeans only supports JUnit 4 tests. Test classes can be created in a NetBeans Java project with File > New File… > Unit Tests > JUnit Test or Test for Existing Class. By default, the test root directory is named test in the project directory. Let’s take a look at a simple example of production code and its corresponding unit test code for a very simple Person class. You can download the sample code from my github project and open it via IntelliJ. PersonTest uses JUnit 5’s @Test and assertion. For JUnit 4, the PersonTest class and method need to be public and different imports should be used. Here’s the JUnit 4 example Gist. Upon running the PersonTest class in IntelliJ, the test passes and the UI indicators are green. 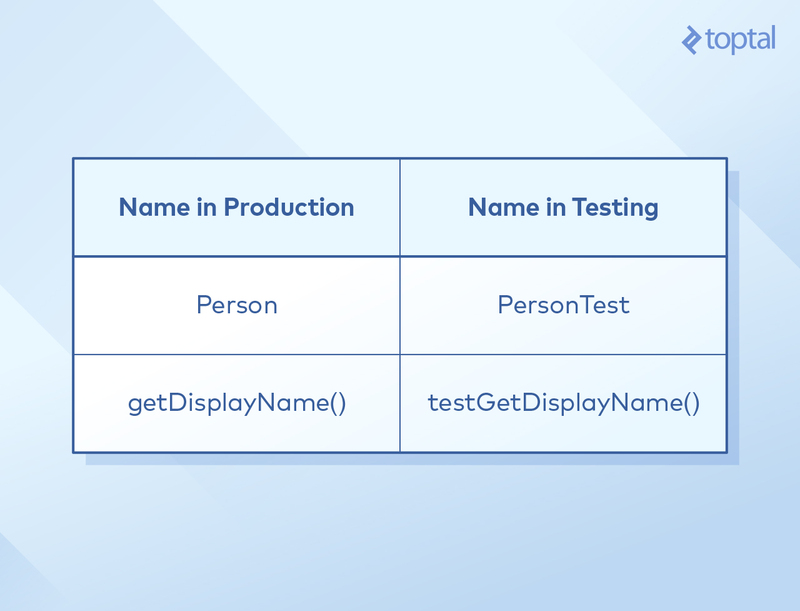 Though not required, we use common conventions in naming the test class; specifically, we start with the name of the class being tested (Person) and append “Test” to it (PersonTest). Naming the test method is similar, starting with the method being tested (getDisplayName()) and prepending “test” to it (testGetDisplayName()). While there are many other perfectly acceptable conventions for naming test methods, it’s important to be consistent across the team and project. We also employ the convention of creating the test code PersonTest class in the same package (com.example) as the production code’s Person class. If we used a different package for tests, we would be required to use the public access modifier in production code classes, constructors, and methods referenced by unit tests, even where it’s not appropriate, so it’s better to just keep them in the same package. We do, however, use separate source directories (src/main/java and src/test/java) as we generally do not want to include test code in released production builds. The @Test annotation (JUnit 4/5) tells JUnit to execute the testGetDisplayName() method as a test method and report whether it passes or fails. As long as all assertions (if any) pass and no exceptions are thrown, the test is considered to pass. 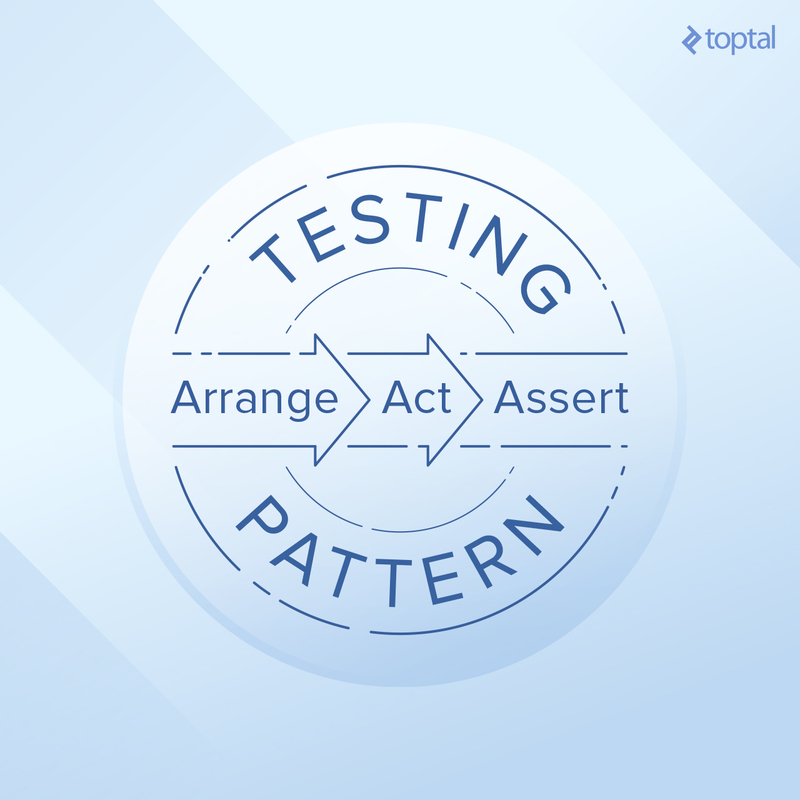 Our test code follows the structure pattern of Arrange-Act-Assert (AAA). Other common patterns include Given-When-Then and Setup-Exercise-Verify-Teardown (Teardown is typically not explicitly needed for unit tests), but we use AAA in this article. The third line, the “assert,” verifies that the result is as expected. Internally, the assertEquals() call uses the “Hayden, Josh” String object’s equals method to verify the actual value returned from the production code (displayName) matches. If it didn’t match, the test would have been marked failed. Note that tests often have more than one line for each of these AAA phases. Now that we’ve covered some testing conventions, let’s turn our attention to making production code testable. It passes today, but what about when we run it one year from now? This test is non-deterministic and brittle as the expected result depends on the current date of the system running the test. When running in production we want to use the current date, LocalDate.now(), for calculating the person’s age, but to make a deterministic test even in a year from now, tests need to supply their own currentDate values. This is known as dependency injection. We don’t want our Person object to determine the current date itself, but instead we want to pass in this logic as a dependency. Unit tests will use a known, stubbed value, and production code will allow the actual value to be provided by the system at runtime. To make it easier to test the getAge() method, we changed it to use currentDateSupplier, a LocalDate supplier, for retrieving the current date. If you don’t know what a supplier is, I recommend reading about Lambda Built-in Functional Interfaces. The test now injects its own currentDate value, so our test will still pass when run next year, or during any year. This is commonly referred to as stubbing, or providing a known value to be returned, but we first had to change Person to allow this dependency to be injected. Note the lambda syntax ( ()->currentDate) when constructing the Person object. This is treated as a supplier of a LocalDate, as required by the new constructor. We are ready for our Person object—whose entire existence has been in JVM memory—to communicate with the outside world. We want to add two methods: the publishAge() method, which will post the person’s current age, and the getThoseInCommon() method, which will return names of famous people that share the same birthday or are the same age as our Person. Suppose there is a RESTful service we can interact with called “People Birthdays.” We have a Java client for it that consists of the single class, BirthdaysClient. Let’s enhance our Person class. We start by adding a new test method for the desired behavior of publishAge(). Why start with the test, rather than the functionality? We’re following the principles of test-driven development (also known as TDD), wherein we write the test first, and then the code to make it pass. At this point, the test code fails to compile because we haven’t created the publishAge() method that it’s calling. Once we create an empty Person.publishAge() method, everything passes. We are now ready for the test to verify that the person’s age actually gets published to the BirthdaysClient. We furthermore augmented the signature of the Person constructor to take a BirthdaysClient object, and changed the test to inject the mocked BirthdaysClient object. Our Mockito-enhanced BirthdaysClient keeps track of all calls that have been made to its methods, which is how we verify that no calls have been made to BirthdaysClient with the verifyZeroInteractions() method before calling publishAge(). Though arguably not necessary, by doing this we ensure the constructor is not making any rogue calls. On the verify() line, we specify how we expect the call to BirthdaysClient to look. Note, that because publishRegularPersonAge has the IOException in its signature, we add it to our test method signature, too. We now implement the Person.getThoseInCommon() method, making our Person.Java class look like this. Our testGetThoseInCommon(), unlike testPublishAge(), does not verify that particular calls were made to birthdaysClient methods. Instead it uses when calls to stub return values for calls to findFamousNamesOfAge() and findFamousNamesBornOn() that getThoseInCommon() will need to make. We then assert that all three of the stubbed names we provided are returned. Wrapping multiple assertions with the assertAll() JUnit 5 method allows all assertions to be checked as a whole, rather than stopping after the first failed assertion. We also include a message with assertTrue() to identify particular names that are not included. Here’s what our “happy path” (an ideal scenario) test method looks like (note, this is not a robust set of tests by nature of being “happy path,” but we’ll talk about why later. Though often overlooked, it’s equally important to keep test code free of festering duplication. Clean code and principles like “don’t repeat yourself” are very important for maintaining a high quality codebase, production and test code alike. Notice that the most recent PersonTest.java has some duplication now that we have several test methods. Extract the IOException object into a private final field. Extract the Person object creation into its own method (createJoeSixteenJan2(), in this case) since most of the Person objects are being created with the same parameters. Create an assertCauseAndMessage() for the various tests that verify thrown PersonExceptions. The clean code results can be seen in this rendition of the PersonTest.java file. What should we do when a Person object has a date of birth that’s later than the current date? Defects in applications are often due to unexpected input or lack of foresight into corner, edge, or boundary cases. It is important to try to anticipate these situations as best we can, and unit tests are often an appropriate place to do so. In building our Person and PersonTest, we included a few tests for expected exceptions, but it was by no means complete. For example, we use LocalDate which does not represent or store time zone data. Our calls to LocalDate.now(), however, return a LocalDate based on the system’s default time zone, which could be a day earlier or later than that of the user of a system. These factors should be considered with appropriate tests and behavior implemented. We have mostly focused on unit tests, but JUnit can also be used for integration, acceptance, functional, and system tests. Such tests often require more setup code, e.g., starting servers, loading databases with known data, etc. While we can often run thousands of unit tests in seconds, large integrations test suites might take minutes or even hours to run. Integration tests should generally not be used to try to cover every permutation or path through the code; unit tests are more appropriate for that. Creating tests for web applications that drive web browsers in filling forms, clicking buttons, waiting for content to load, etc., is commonly done using Selenium WebDriver (Apache 2.0 license) coupled with the ‘Page Object Pattern’ (see the SeleniumHQ github wiki and Martin Fowler’s article on Page Objects). JUnit is effective for testing RESTful APIs with the use of an HTTP client like Apache HTTP Client or Spring Rest Template (HowToDoInJava.com provides a good example). In our case with the Person object, an integration test could involve using the real BirthdaysClient rather than a mock one, with a configuration specifying the base URL of the People Birthdays service. An integration test would then use a test instance of such a service, verify that the birthdays were published to it and create famous people in the service that would be returned. JUnit has many additional features we have not yet explored in the examples. We will describe some and provide references for others. 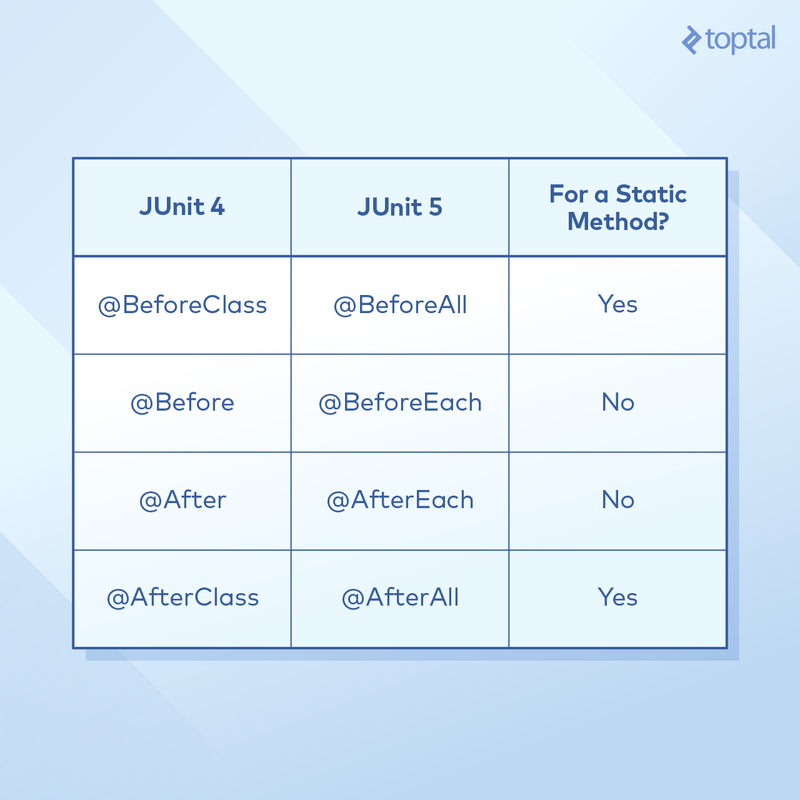 It should be noted that JUnit creates a new instance of the test class for running each @Test method. JUnit also provides annotation hooks to run particular methods before or after all or each of the @Test methods. These hooks are often used for setting up or cleaning up database or mock objects, and differ between JUnit 4 and 5. In our PersonTest example, we chose to configure the BirthdaysClient mock object in the @Test methods themselves, but sometimes more complex mock structures need to be built out involving multiple objects. @BeforeEach (in JUnit 5) and @Before (in JUnit 4) is often appropriate for this. The @After* annotations are more common with integration tests than unit tests as the JVM garbage collection handles most objects created for unit tests. The @BeforeClass and @BeforeAll annotations are most commonly used for integration tests that need to perform costly setup and teardown actions once, rather than for each test method. For JUnit 4, please refer to the test fixtures guide (the general concepts do still apply to JUnit 5). Sometimes you want to run multiple related tests, but not all the tests. In this case, groupings of tests can be composed into test suites. For how to do this in JUnit 5, check out HowToProgram.xyz’s JUnit 5 article, and in the JUnit team’s documentation for JUnit 4. The @DisplayName annotation is also new to JUnit 5, allowing you to describe the test for reporting in string format, to be shown in addition to the test method identifier. Although @Nested and @DisplayName can be used independently of each other, together they can provide for clearer test results that describe the behavior of the system. Hamcrest can be used with both JUnit 4 and 5. Vogella.com’s tutorial on Hamcrest is quite comprehensive. The article Unit Tests, How to Write Testable Code and Why it Matters covers more specific examples of writing clean, testable code. The JUnit 4 Wiki and JUnit 5 User Guide are always an excellent reference point. The Mockito documentation provides information on additional functionality and examples. We have explored many aspects of testing in the Java world with JUnit. We have looked at unit and integration tests using the JUnit framework for Java codebases, integrating JUnit in development and build environments, how to use mocks and stubs with suppliers and Mockito, common conventions and best code practices, what to test, and some of the other great JUnit features. It is now the reader’s turn to grow in skillfully applying, maintaining, and reaping the benefits of automated tests using the JUnit framework. If all you want to test is that the exception is thrown that is indeed simpler. However, the way the blog author does it allows you to test additional details such as the exception message in the example or any other custom fields the exception might have. As a results-driven, agile software engineer, Josh focuses on implementing high-quality code. He is thorough with details and iteratively drives projects to completion. He is equally comfortable owning an entire project or dividing the work across a team. He also regularly contributes to all phases of the software development lifecycle.